The next ‘Safer Internet Day’ will be the thirteenth edition of the event and will take place worldwide on Tuesday 9th February 2016. 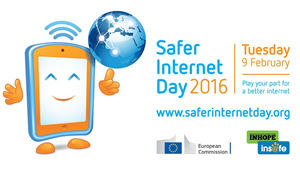 The theme for 'Safer Internet Day 2016' will be 'Play your part for a better internet'. The day will give us the opportunity to think about the positive uses of technology and the role we can all play to create a better internet. “The theme encourages us to consider what we do online, the way we behave and communicate and how we should always endeavour to be positive and post positive content. To celebrate the fantastic work being done through Safer Internet Day activities around the world, we are delighted to be running a competition for schools. To get involved, all your pupils have to do is come up with a positive e-safety tip that can be tweeted during the run-up to and during ‘Safer Internet Day’. Entry is open now and schools can enter as many tips as they wish. All entries must be received before midnight on February 8th 2016 to be included in the competition. Please see the competition terms here. There will be 3 categories, Best Primary School Tip, Best Secondary School Tip, Best Tip from an Overseas School. Winners will be chosen and announced on Safer Internet Day. Winners will receive one years free Premium Plus membership to E-safety Support for their school. The entries have been coming in think and fast. To see the entries we have received so far, click here.